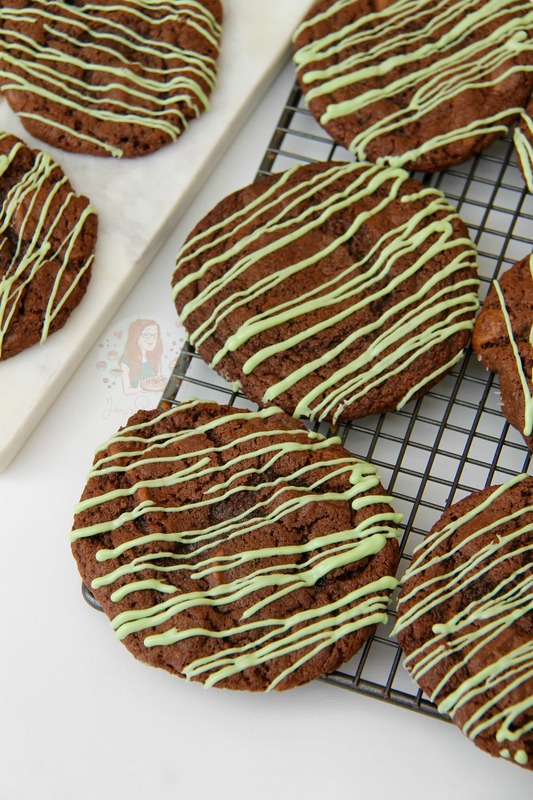 Crunchy, Chewy, Soft, and Gooey Mint Chocolate Chip Cookies – Mint Chocolate Flavouring, Gooey Double Chocolate Cookie, Oodles of Chocolate Chips. 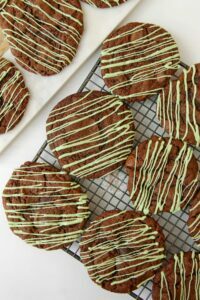 I’ve been wanting to post a good Cookie recipe for a good while, and I just haven’t been very inspired. I have loads of different ones planned, I just haven’t really been in the Cookie mood. 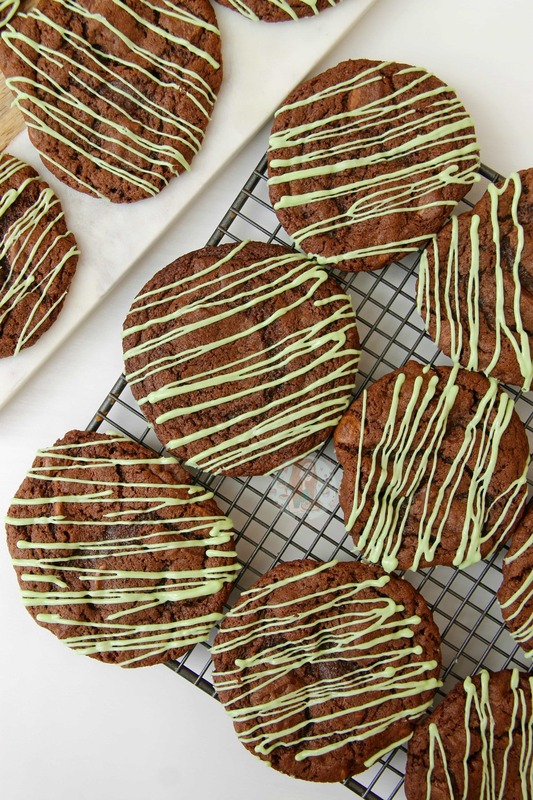 After Foodie Flavours sent me a selection of flavourings to try out, I knew I MUST do something with the Mint Chocolate one, so I knew cookies were on the cards. 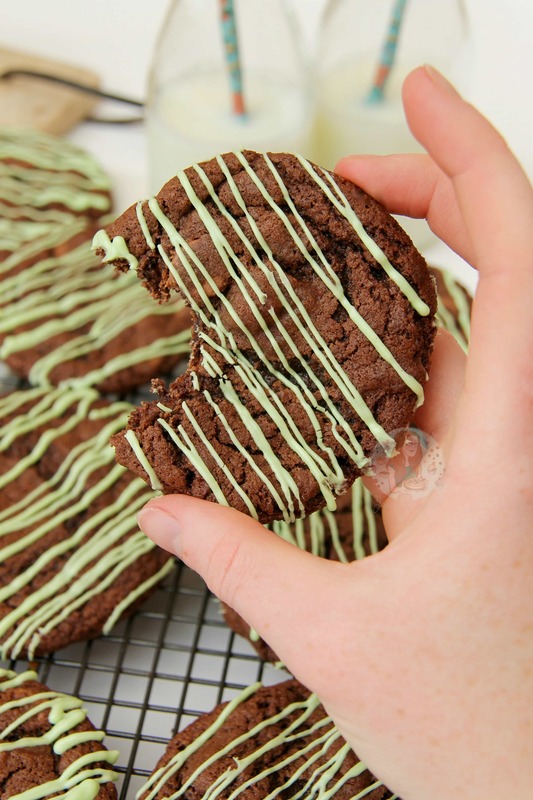 After the success of my Mint Aero Brownies recently, I know you’ll love these too. I based this recipe on a few of my other recipes such as my Terry’s Chocolate Orange Cookies and Triple Chocolate Chip Crinkle Cookies as they are always so popular with my readers, and my family. Something about the cookie dough itself is just perfect, and I love it. It has never failed me! I did changed it up slightly in this one and just used Light Brown Sugar rather than a combination of Light Brown Sugar and Granulated Sugar and it just made them taste even more delicious and I wanted to know if it made a difference all not. I have found that using just granulated sugar is slightly unreliable, whereas just brown sugar works a treat! 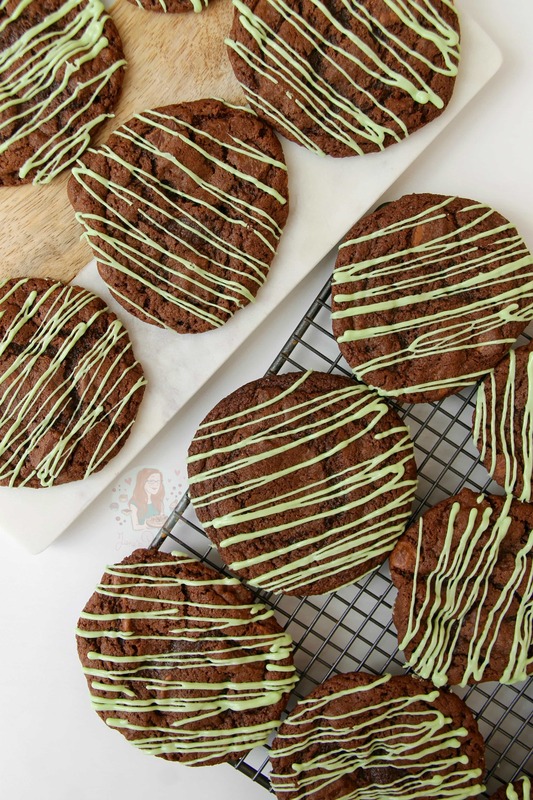 I ended up using some Milk Chocolate Chips in this, as well as a bar of a Lindt mint chocolate which I chopped up so a similar size as the chips – and it was delicious. 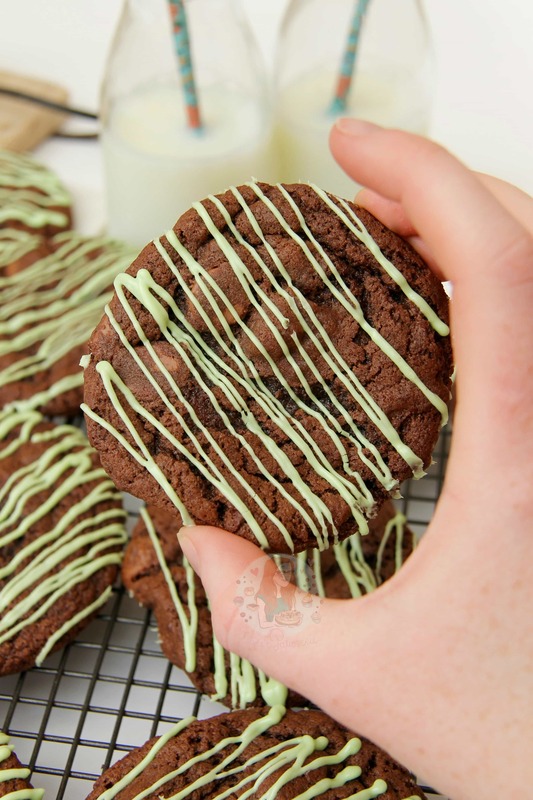 You can obviously use whatever flavour chocolate chips you like, but I feel like it fit the cookies perfectly! 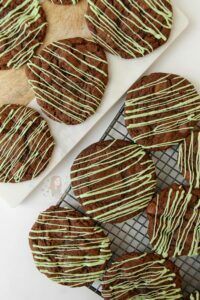 I used the Mint Chocolate Flavouring as it was another flavouring I wanted to try out, but you can easily use a Peppermint flavouring instead! I usually only put 6 cookies on a tray at once so that they can’t stick together and grow into funny shapes, and I typically get 15 or 16 cookies out of a batch as I use a 5cm cookie scoop! 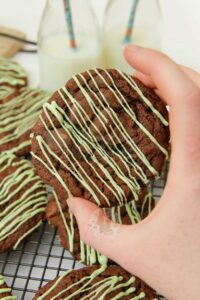 I decided to drizzle on some green colouring white chocolate so that these looked minty, otherwise its hard to see they’re minty by themselves in the picture, but this is obviously optional. I hope you love this recipe as much as I do! Enjoy! 1) Preheat your oven to 190C/180C Fan/375F and line two-three baking trays with parchment paper, leave to the side! 2) Mix together the Unsalted Butter and Light Brown Sugar until light and fluffy and thoroughly combined – using an electric mixer with the paddle attachment makes it get very fluffy and perfect! 4) Fold in the Chocolate Chips, and spoon the mixture onto the trays and make sure they are suitable spread out so they stay separate! (I usually fit 6 on each tray to be safe) I also use a cookie dropper/ice cream scoop to make them identical sizes. 5) Bake the cookies in the oven for 12 minutes until spread out perfectly & nice and crinkly. 6) Once baked, remove from the oven and leave to cool on a wire rack. 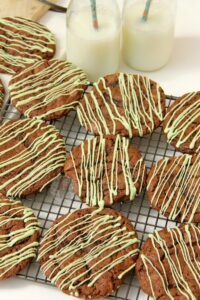 Melt the White Chocolate on a low heat and mix in some green food colouring, drizzle over the cookies and leave to set. Finally, gobble them all up – but people might get a bit funny if you don’t share them! 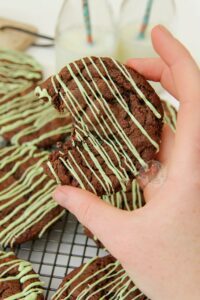 These delicious little treats are perfect as they are, but you could drizzle over some minty coloured chocolate to give them a bit of extra show! 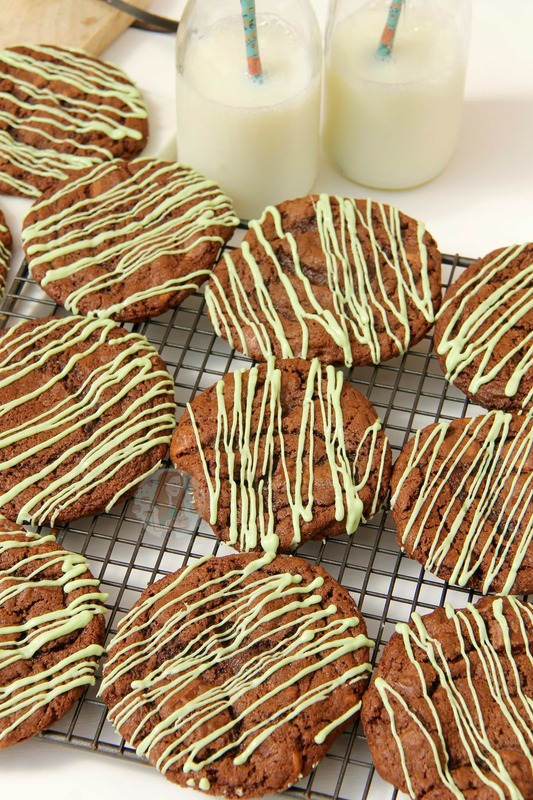 I used the Foodie Flavours Mint Chocolate Flavouring in these as I was sent a few different flavours to use. I highly recommend them as all of the flavourings are Gluten Free, Vegetarian (natural ones), Egg Free, Dairy Free and utterly delicious! If you wanted to just use one type of chocolate you could as well, I just always stick to the same amount weight wise! I got the cute little milk bottles from http://www.glassjarsandbottles.com, and the straws from Iced Jems! Older Next post: Kinder Bueno Cupcakes! Newer Previous post: Lemon and Blueberry Pancake Cake! I use self raising flour in these cookies already?